Cauliflower ear is the term given to those whom suffer from lumpy or heavily scarred external ears, usually as the result of repeated trauma, occurring often in boxers and wrestlers. How are Cauliflower Ears Formed? When an ear is repeated struck or damaged the substance supporting the ear and giving it it's shape, the cartilage, can become damaged or torn. 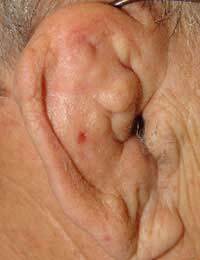 If this happens, blood clots can form under the skin and prevent blood flow from reaching the damaged part of the ear. If blood flow is restricted, oxygen and nutrients to allow it to heal cannot reach the area and the cartilage may remain permanently misshapen. The damaged cartilage can shrivel and take on the appearance of the top of a cauliflower, hence the name cauliflower ears. For successful treatment of cauliflower ear, medical advice must be sought immediately after the injury has occurred. This is because the fluid that has collected under the skin, or the blood clot, has to be evacuated from the area as soon as possible in order for healthy blood flow to the area to resume and aid healing. The doctor will normally incise the area, or use the broken area on the skin if present and remove the blood clot. They will then clean the area to remove and bacteria and debris and place a clean sterile dressing over the ear. This dressing will act as a compress to the affected area helping to prevent any further swelling or bleeding.The dressing will normally remain in situ for up to ten days when it will be removed and the wound re-assessed and treated as necessary; this may mean applying a fresh dressing for a further period of time. During this treatment over the counter painkillers may be advised to relieve discomfort and the person should refrain from any activities that may cause further trauma or risk removal or soiling of the dressing.Most physicians will recommend a course of anti-biotics as the outer ear can become infected easily risking the overall health of the more delicate parts of the ear. As these injuries usually occur from contact with others, this also increases the risk of infections developing.The full course of anti-biotics must be taken in order for them to be most effective. The best way of preventing cauliflower ears is to refrain from a career that encourages trauma to the head. If a heavy contact sport is chosen, either as a career or a hobby, wearing the correct and recommended hear protection is essential, not just for preventing this condition, but as a life saving device.Always ensure the correct headwear is selected for any other activities where the head is at risk such as cycling, climbing or skiing.It may only take one injury to permanently deform the shape of the ear, and this may be irreversible. Cauliflower ear is a risk of participating in heavy contact sports, especially when protective headwear is not worn. Treatment must be sought immediately after the injury occurs in order for it to be most successful.